250ml by Lee Kum Kee. 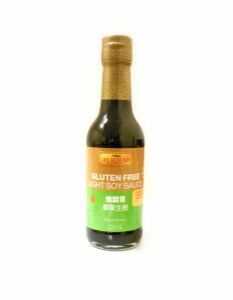 Lee Kum Kee Gluten Free light soy sauce is naturally brewed, has noadded preservatives and made with non GM soybeans. This is a special gluten free version but provides you the same rich soy flavour and aroma which will delicately enhance the taste of any dish. Ingredients: water, soybeans, salt, sugar, corn starch. Suitable for Vegetarians and Vegans. Certfied Gluten Free.